Polly want plenty of air and no stress. Aspergillosis is one of your parrot's worst enemies. This highly infectious respiratory disease is likely to make your parrot less lively and less chatty than usual. A swift visit to your vet at first sign of the disease should ensure a speedy recovery, as successful treatments do exist. Aspergillus fungus is a common cause of respiratory problems in pet birds. Occasionally wild birds get this disease as well. Unfortunately, parrots are very susceptible to the disease, especially the African grey and Amazon species, according to Michael Campagna at Veterinary Partner. The fungus is in the bird's surroundings and it shouldn't cause any problems in a healthy parrot, but if your feathered friend is a bit under the weather or he breathes in large amounts of the fungus spores, then he may well develop aspergillosis. Your bird comes in contact with the spores through damp bedding in his cage, food that's been stored too long or poor ventilation and humidity. This disease develops gradually in the lungs, so your parrot may not show any symptoms immediately. Early warning signs to look out for are lethargy and a poor appetite; later you'll likely see gradual weight loss. When you let him out of his cage for a fly around the room, he is likely to become breathless quicker than usual. Difficulty breathing while still and odd breathing noises are signs that the disease is advanced. It's very important to get your parrot to the vet for diagnostic tests as soon as you spot any symptoms. The standard treatment for aspergillosis is an antifungal drug. The most commonly prescribed one is itraconazole, because it has the least side effects. The drug is given by mouth and, according to vet Wendy Brooks, it represents something of a breakthrough in the safe treatment of fungal infections. Treatment lasts for six weeks to six months depending on the severity of the aspergillosis. Amphotericin B is another drug treatment; however, this is known to have toxic side effects and is usually given only to birds who need hospitalization for the disease, and then only for short periods of time to avoid liver damage. 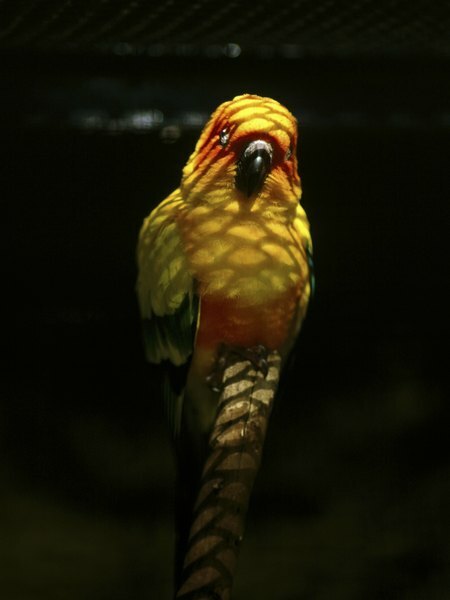 It's impossible to remove the aspergillus fungus entirely from your parrot's environment, because every bird has some of the spores in his air passages. You can limit his exposure to more of the fungus: Remove any wet food or bedding from his cage regularly, and make sure plenty of air is circulating around his cage area. Also, a happy and stress-free parrot is much less likely to develop aspergillosis, according to vet Michael Campagna, who also advises regular checkups so your vet can spot any problems early on. What if Lyme Disease in a Dog Doesn't Go Away After Antibiotics? What Happens When Your Goldfish Has Fin Rot? How Do Cats Get AIDS? Can a Cat Contract Listeriosis?